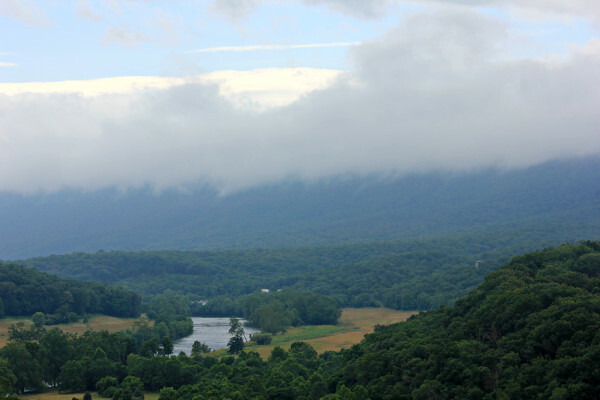 Bill, Cindy, Robert, and I (Laura) made it to Shenandoah River State Park around noon. An overcast sky threatened rain, but we headed to lunch at the Massanutten Picnic Shelter in good spirits, hoping for the best. Unfortunately, luck was not on our side, as we were met with a huge downpour right in the middle of our lunch. The rain continued throughout the afternoon, postponing several of our planned video shoots. A group of young equestriennes, however, refused to let the rain stop their video shoot. 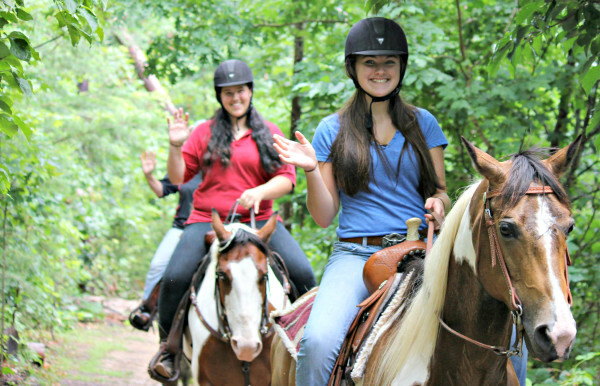 Despite their rain-soaked clothing, they were still eager to ride. 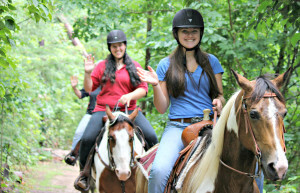 Fortunately, the rain cleared up long enough to shoot footage of them riding. The evening ahead allowed for a pleasant time in a beautiful new lodge that can accommodate up to sixteen guests. Needless to say, this was truly our home away from home! After dinner, Bill and Cindy taught me how to play poker (not for money–just poker chips!). The game continued through the night until we were all too tired to bet any further. We started Friday off by touring the Visitor Center, shooting video footage of the animals and artifacts on display inside, as well as footage of an actual visitor being greeted by park staff at the desk. Our next shoot took us down a trail meant for walking, but as a video crew, we were granted special permission to drive it! There was a small creek that we had to cross on the trail, and Bill was most excited to drive right on through it; thank goodness we were in an SUV! We got out of the car at a small cabin to shoot some of our volunteer hikers, bikers, and birdwatchers. 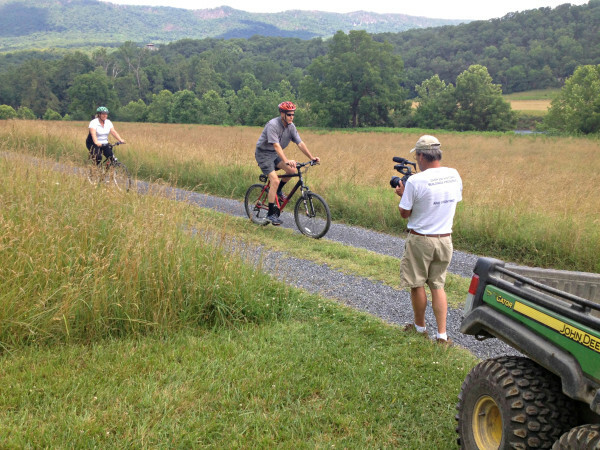 Bill and Cindy were then able to ride up an even steeper trail in the park’s ATVs in order to capture more footage of our volunteer hikers and bikers. Robert and I stayed behind, and I was able to take some still shots of the area. 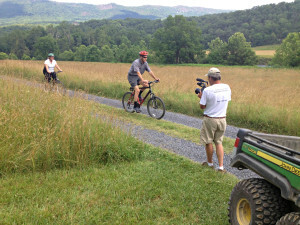 When the ATVs brought Bill and Cindy back, we drove around the trail some more, hoping to get some shots of kayakers along the Shenandoah River. We missed the kayakers, but saw some wildlife instead! Bill was able to get some video footage of a baby otter and a bunny, although the little fawn we saw was too camera shy. 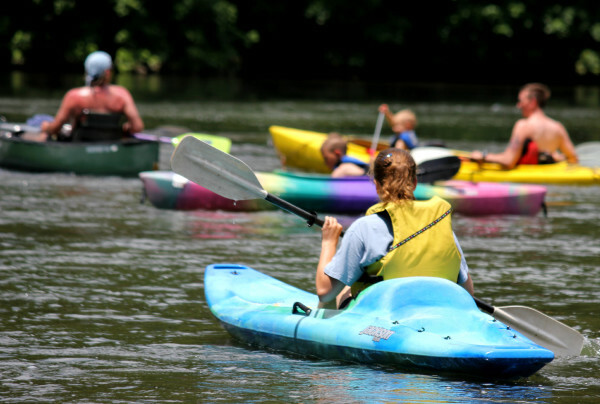 After another lunch at the Massanutten Picnic Shelter, the four of us headed off to the kayak launch on the Shenandoah River to acquire footage of several kayakers on the river. While we were there, we were able to get some adorable footage of kids swimming and splashing around in the river, as well as some shots of fishing and picnicking at one of the many picnic shelters. Contrasting rainy Thursday, Friday gave us perfect weather with lots of sun and a bright, cloudless sky. Because it was really quite warm, we all agreed that taking a dip in the Shenandoah River would be a great way to cool down. We got changed into swimsuits, headed back to the kayak launch, and got into the cool, spring-fed river water. The river at this point was relatively shallow and so clear that we could see the gigantic boulders covering the bottom. We spent a good hour and a half cooling off in the water. It was here that I discovered that I had the ability to “walk on water” when I sprang out of the water so fast at the sight of snakes swimming along the bottom. I didn’t realize until mid-spring that the so-called snakes were really just sticks! Ironically, I didn’t even flinch at the sight of a real garden snake on the bank just minutes later. That evening, we acquired the last crucial park footage that we needed: footage of the campgrounds. However, Bill was not completely satisfied because we had not yet crossed paths with a bear. We had been told that black bears live in this particular park, and some of our volunteer hikers had even seen them. So, we plotted ways to try and get a black bear to cross our path. After dinner, we decided to drive down the path we had taken earlier to scour the tall grass and woods for any signs of movement. Alas, no bear was to be seen. Bill was able to spot a deer running through the woods on our “bear hunt” though, and – with Cindy driving slowly – he filmed the deer running through the forest all while maintaining a perch on the car door. When we’d given up all hope of ever seeing a bear, we decided to take a different trail up through the woods, not knowing where it’d take us. We all laughed aloud when it took us right up to the very lodge that we were staying in! To see a photo gallery of images that I took while visiting Shenandoah River State Park, click here.